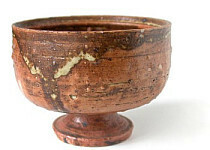 Hand-thrown in chamotte stoneware with speckled reddish brown oxide-glaze. Arabia Studio piece made sometimes in 1950-1953. 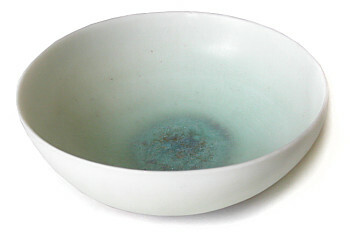 Thin porcelain glazed in pale green; turquose and gray glimmering crystalline glaze in the middle. 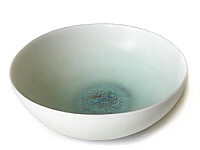 Thin porcelain glazed in pale green; blue, turquose and gray crystalline glaze in the middle. A monograph of the important Arabia studio artist Kyllikki Salmenhaara, one of the most revered ceramic artists from Finland. She, along with Muona, Bryk, Kaipiainen, etc., helped establish reputation of Arabia’s art department, winning many gold and silver medals from the 1940s through the 1970s, including a grand prix in Milan in 1957. This book is a great reference for collectors, and for fans of modern Scandinavian design, with many color and b/w photos. Kyllikki Salmenhaara is remembered first and foremost as a skilful pedagogue, and as a reformer of ceramics teaching in Finland. 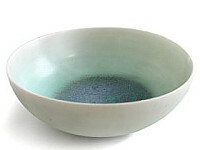 Salmenhaara began to study at the Department of Ceramics of the Central School of Applied Arts under Elsa Elenius. Her studies were interrupted during the Second World War when Salmenhaara served in a women's auxiliary capacity. She graduated in 1943 and went on to work for three years at the Kauklahti glassworks near Helsinki. Before entering the service of the Arabia factory, Salmenhaara spent a trainee period in Nathalie Grebs's studio in Denmark and worked in Sakari Vapaavuori's studio in Finland. 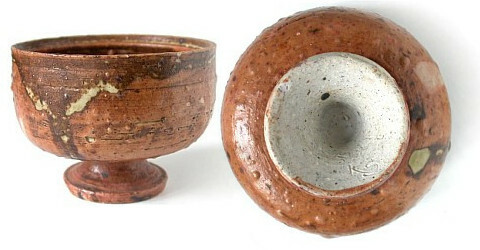 'Ceramics are not only to be looked at. They should be touches and felt'. Kyllikki Salmenhaara's production shows imagnitive flying saucers, robust vases and jugs, some with a close approach to the utilitarian. Sometimes she used brilliant blue copper glazes, but more offen she left her objects inglazed or only partly glazed with lovely beaty spots in the fired clay. Kyllikki Salmenhaara worked as a member of Arabia team from 1947 until 1961. 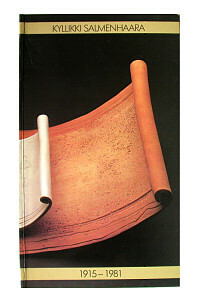 Together with other designers of the Arabia factory's Art Department, Salmenhaara participated in numerous int' exhibitions and was often awarded prizes, particularly at the Milan Triennials of 1951-1960. She received the Pro Finlandia medal in 1961. In the autumn of 1963, after Elsa Elenius became ill, Salmenhaara was appointed to carry on the teaching of ceramics at the Ateneum in Helsinki. One of the goals of that period was to bring teaching closer to professional practices and the needs of industry. Salmenhaara began to systematically develop material studies and the teaching of small-scale production methods. Kyllikki Salmenhaara was appointed to Finland's first post as artist professor in the field of design and applied art from 1970 to 1973. She died of cancer in 1981, but her influence has been passed on to later generations of ceramists.